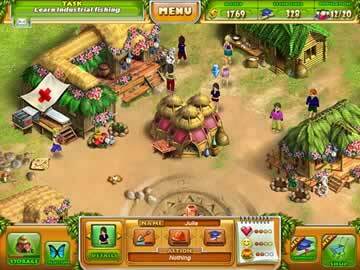 Farm Tribe Game - Download and Play Free Version! Help the beautiful Annie and her elderly father save their farm! 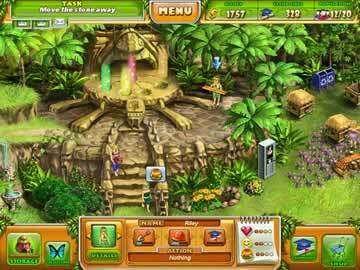 In Farm Tribe, Annie and her father have been conducting research in the Amazon rain forest in an effort to unlock the secret of the Mayan temples. In order to provide funding for the project, they have started a small farming operation. Unfortunately, neither of them know a thing about farming! You will need to quickly whip the farm into shape by organizing the workforce and changing things around so that the farm becomes profitable. Your first job as farm manager will be to build more living space to accommodate additional workers. Although this first task is quick and easy, things quickly start getting more complicated. Your next order of business will require you to choose a particular type of food you want to grow on the farm. There are tons of options available to you, including lettuce, carrots, tomatoes, bananas, strawberries and more. The initial choice of what to grow will impact the decisions that are available to you later on in the game, so plan carefully! After you produce a few of the basic food types, there are several directions in which to progress. The quickest and easiest choice is to just sell the food outright, which doesn't require any extra work but yields the smallest amount of profit. Another alternative would be to start building food processing buildings, which allow your workers to convert basic foods into more advanced types. For example, a canning factory combined with a fruit processing hut will allow your workers to convert strawberries into jars of strawberry jam. Another option you can pursue is making customized dishes. This involves combining several basic foods of your choosing into a customized dish. A good example of this would be a salad; you can pick out what type of lettuce you want to use as well as the vegetable garnishes and dressing. These dishes take the longest for your workers to make, but they're usually worth the extra effort as they sell for lots of money. If you have a green thumb, this might be just the right game for you! The South American farming theme in Farm Tribe is definitely very unique and the game has really paid attention to the details involved with farming. If you have any experience with farming in real life you'll definitely appreciate all the intricacies involved with growing things. 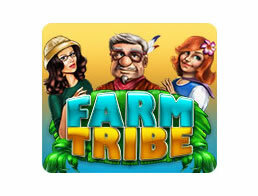 Farm Tribe is an excellent game with lots of strategy elements!